First official post of 2012 (the WordPress generated summary of 2011 doesn’t count) is about my painting backlog of projects. I’ve decided that my one New Year’s resolution for 2012 that is hobby related will be to reduce the number of unpainted figures that I own. This will be a tough job as I don’t intend to stop buying new stuff, but it does mean that I will need to start selling off or otherwise getting rid of my considerable collection of unpainted figures that languish in my workshop. I didn’t do too badly on my last five projects list for 2011. 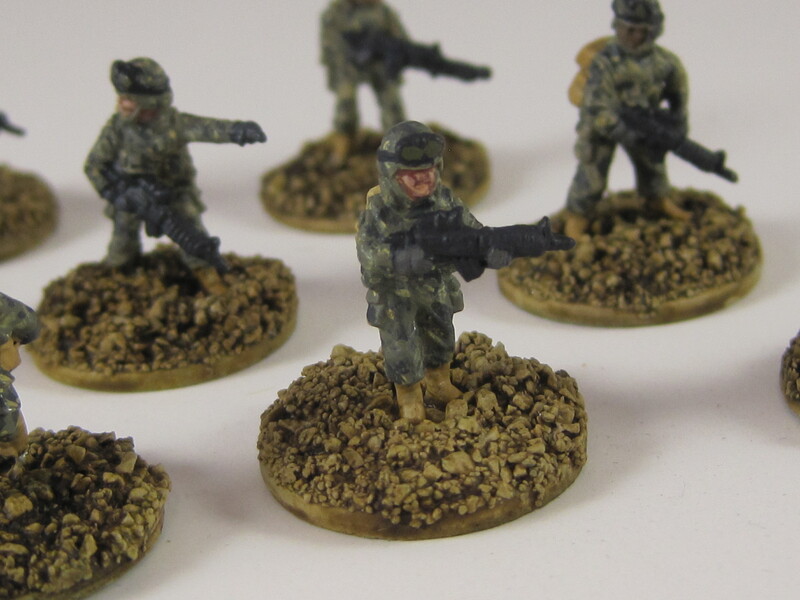 I got about 1/2 the Vietnam 15mm figures that I had primered done. I finished off the Space Worms. I got a good chunk of Picoarmor stuff done. I totally blew it on the Martian Racing skiffs, however. Not a one of them even prepped for priming. Sigh. 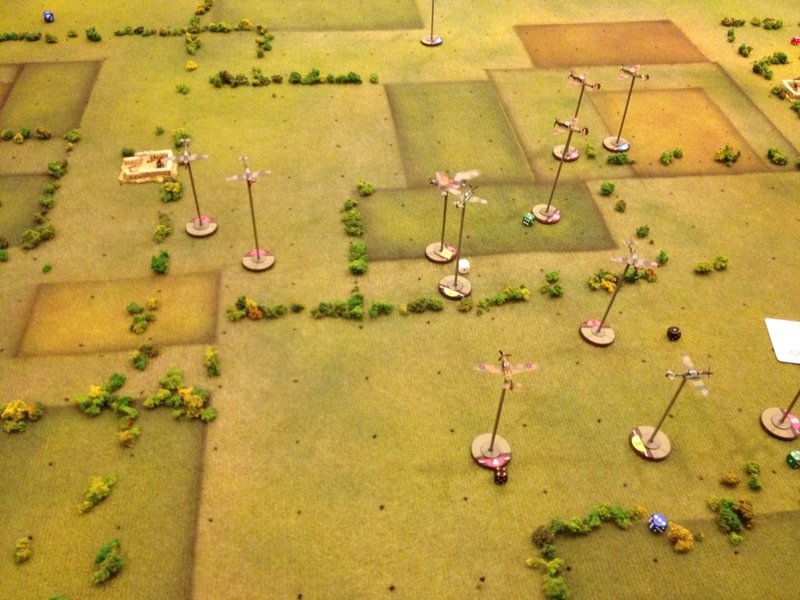 After discussions with my son Will, we’ve decided to pare down the 28mm zombie stuff that we own. Why? Well, it takes up way too much space in our workshop/crawlspace storage. The buildings we have are mostly ‘O’ scale railroad buildings and they are huge in terms of footprint. We’ll keep the basics for smaller layouts, but the big city layout has to go. Also on the chopping block is my vast collection of unpainted Clan Wars figures. I bought heavily when it first came out, but I have yet to play a single game, and the number of painted figures still numbers less than 100. 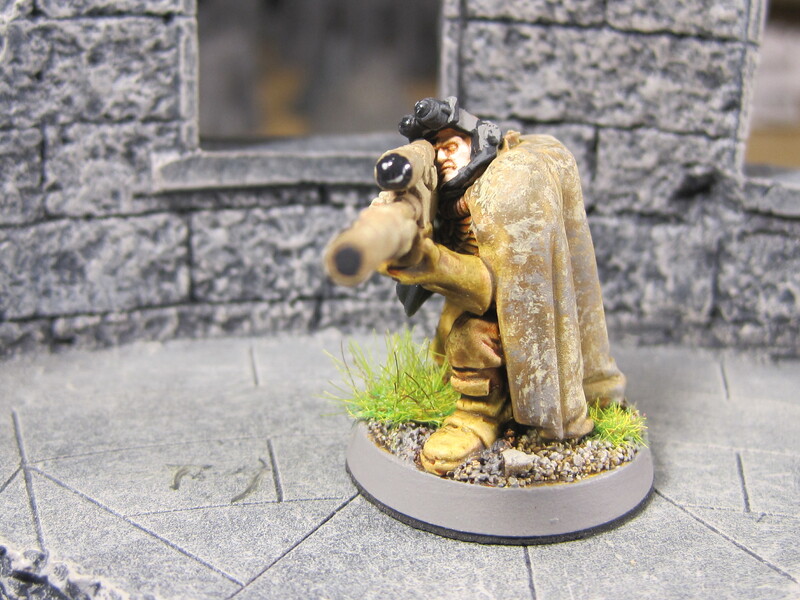 I am far more interested in 28mm historical Samurai anyway, so this stuff will be up for sale soon. Finally, I will be getting rid of the Wild West miniatures I started collecting, including the Old Glory buildings that I purchased. 1) 15mm Vietnam: I want to finish off the rest of the primered miniatures, get a few more buildings done, and add some helicopters and other vehicles. 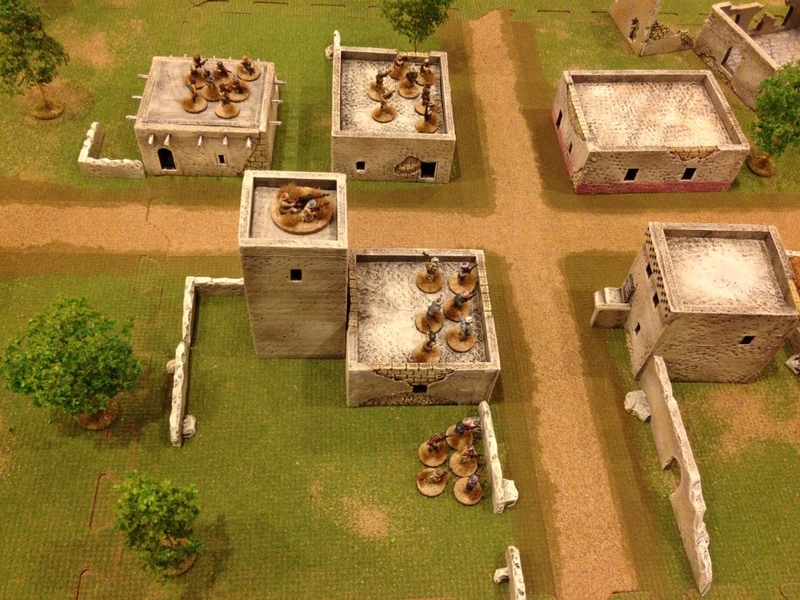 2) 15mm Tomorrow’s War: As AAG will continue to support this game, it would be remiss of me not to support something in which I’m involved. Next up are some CMG heavy grav tanks, some GZG OUDF that my son Will painted (I need to finish the basing), and some GZG New Israeli troops. I also want to throw an alien race or two into the mix, including expanding my Felid forces from Khurasan. 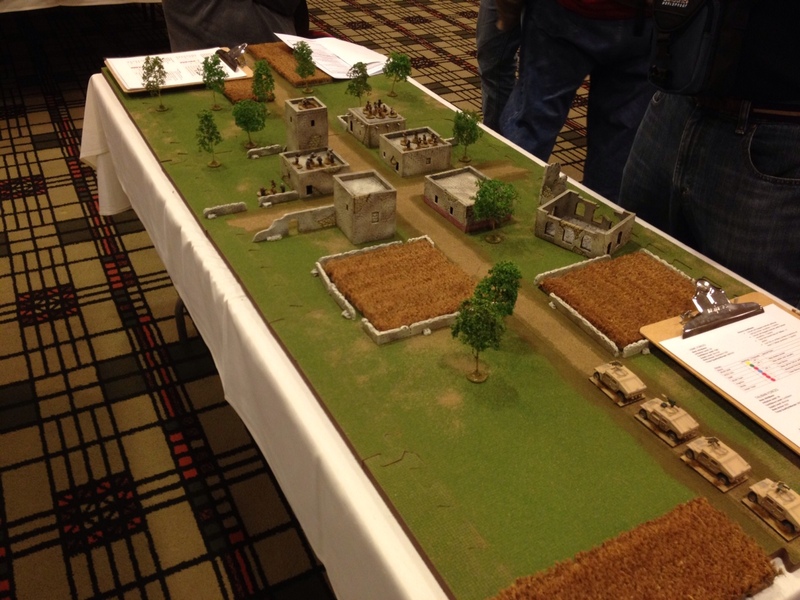 3) 15mm World War 2: I want to continue building my Battlefront: WW2 units, especially for the Eastern front. 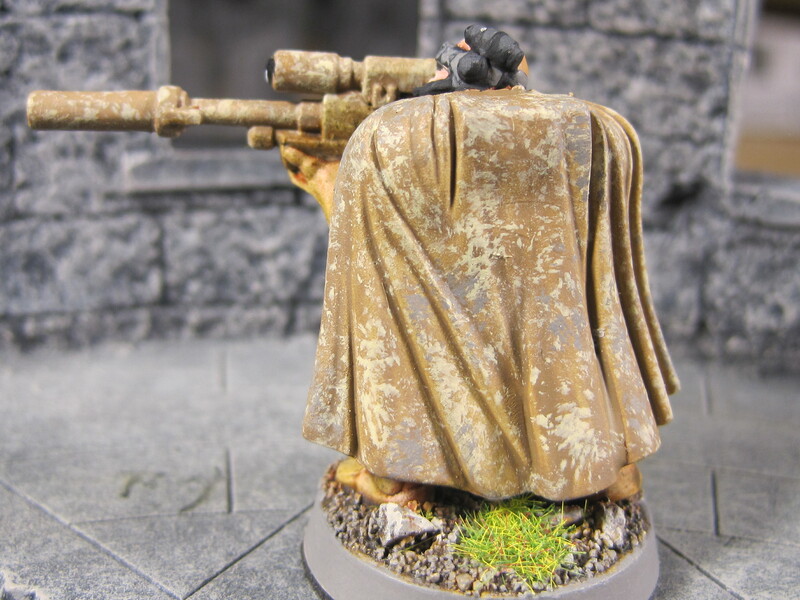 I also intend to start painting and basing individual figures in 15mm for Force on Force games. 4) 3mm Picoarmor: I am continuing to write my homegrown mass combat rules and intend to use them with Picoarmor stuff for playtesting. I am focusing on two areas. First, Cold War stuff for 1980s. Second, WW2 Western Desert. 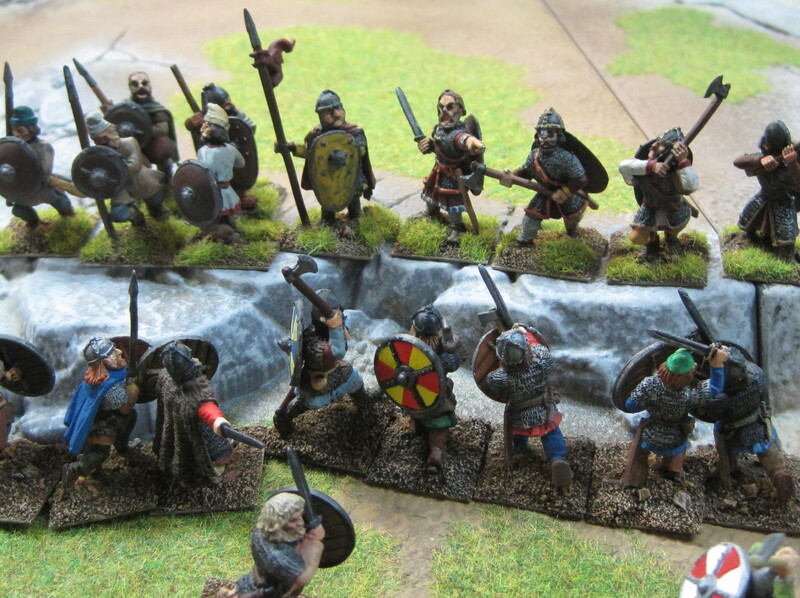 5) 28mm Miscellaneous: I am currently working on more 28mm Vikings, Saxons and Normans for Dark Age skirmish games (including my own home grown rules). I also promised Will that I would paint up some Warmachine stuff to fight his growing Khador/Menoth armies. I have pretty sizable Cygnar and Menoth forces myself, but I have started to collect and paint an Orboros army with an autumn theme to it. 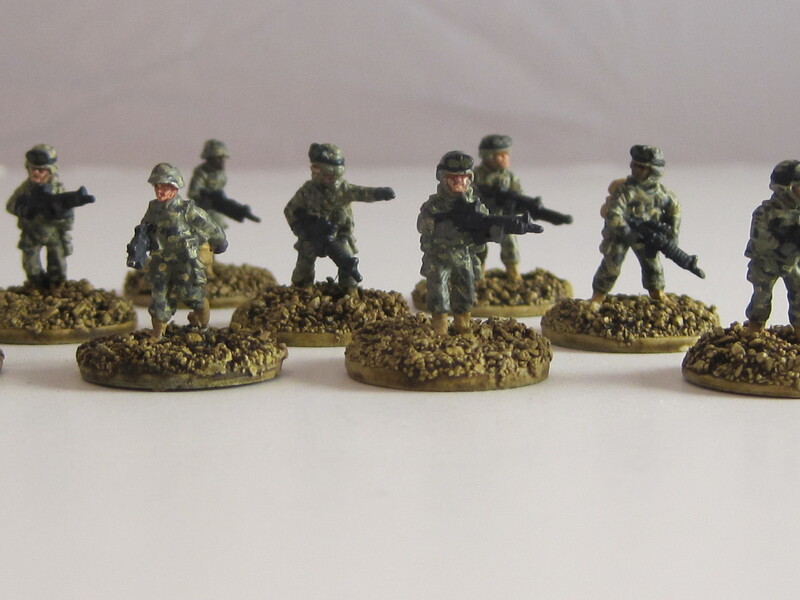 1) 15mm Vietnam: I am finishing up about 20 more Vietcong (mix of Main Force and Local Force figures from Flashpoint) and have a short platoon of US Army grunts (mix of Flashpoint and Battlefront figures) about 1/2 done on the painting table. This will take priority so I can get some gaming time in. 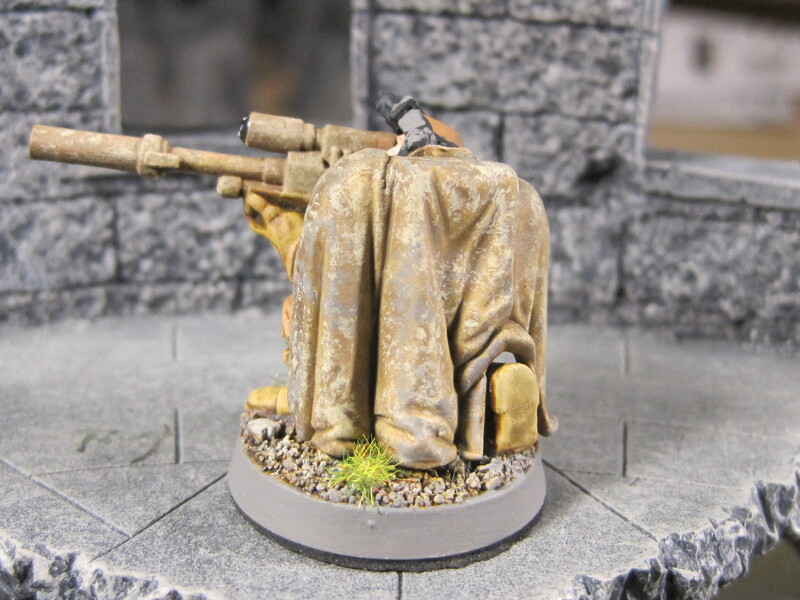 2) 15mm Vietnam Terrain: I have 3 more Timecast hooches to finish, plus five tunnel/hot spot markers that need to get done. I am using the Khurasan abandoned mine shaft pieces as the basis for the tunnel markers, with some heavy green stuff modifications. 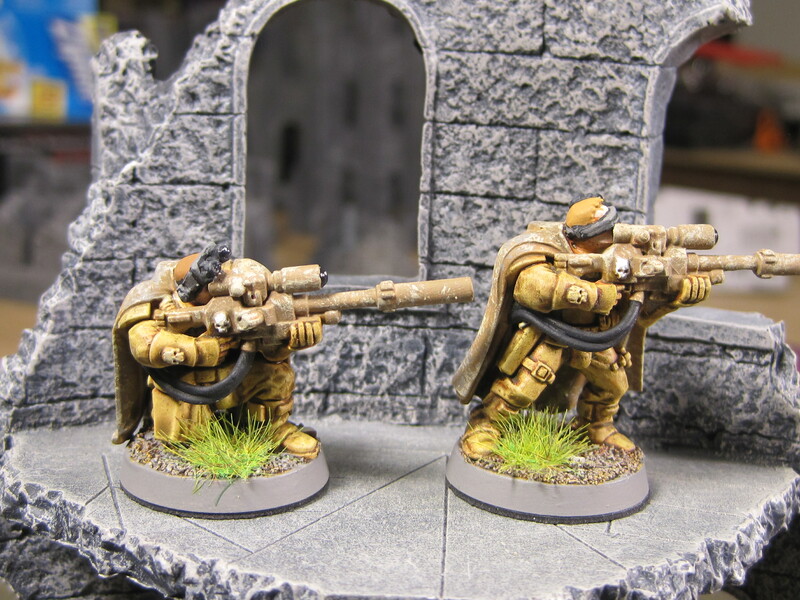 3) 15mm Space Worms from O8: I picked up a few packs from the guys at Picoarmor and want to have a unit of 27 (3 nine-worm squads) done for Tomorrow’s War. 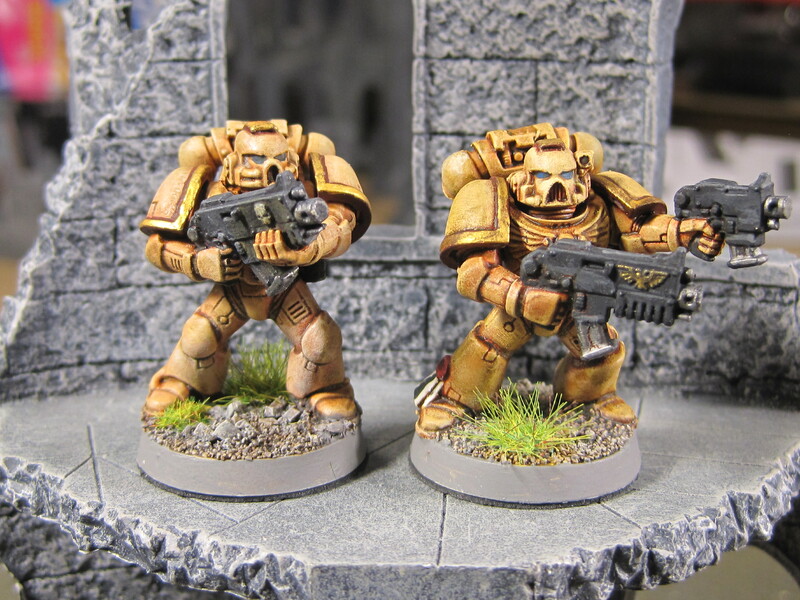 To go with them, I have three of Reaper Miniatures cave worm models (the plastic prepaints, not the metal ones) that I aim to repaint as “heavy tanks” for the worms. 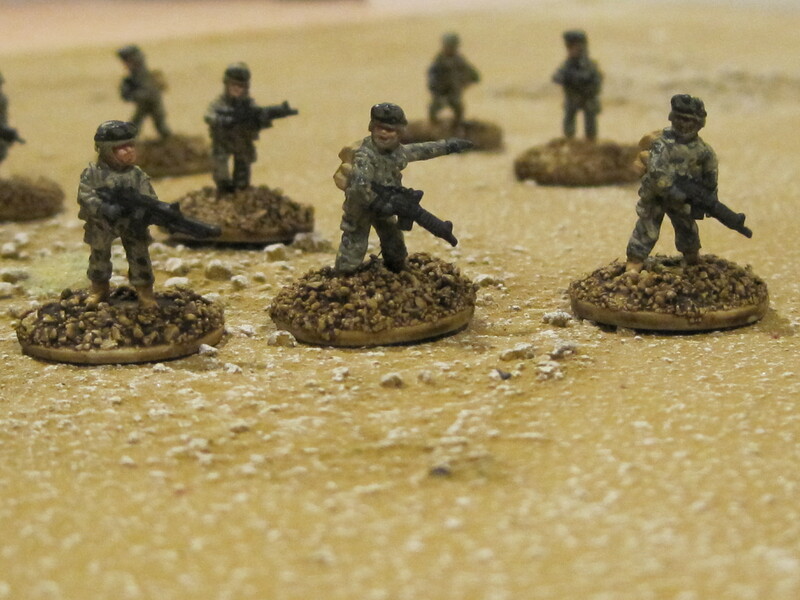 4) 3mm Picoarmor: Using one stand = one platoon, I am painting up some 1985 US/NATO and WARPAC forces for a large scale game aimed at the Battalion/Regimental command level. I’m doing my own home grown rules, so I’m keen to get these finished so I can get to working out the mechanics. 5) 28mm Martian Racing Skiffs: I bought some of these models from Brigade Games (they’re the old Parroom Station models) and want to start a beer & pretzels Martian racing league at our local gaming store. This should take me well through the holidays, so we’ll see how much I’ll actually get done. I’ll post progress reports and pictures as these things get finished. Another November and another Legends in the Fall convention come and gone. 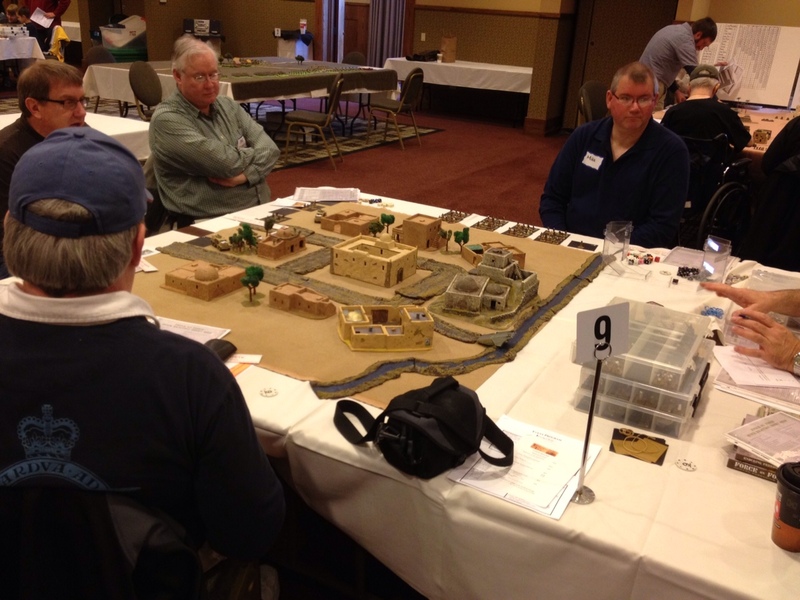 This year’s convention marked the first time I was a vendor instead of a game master, although I ran two Force on Force games at the booth and my sons put on two Tomorrow’s War games as part of the scheduled events. 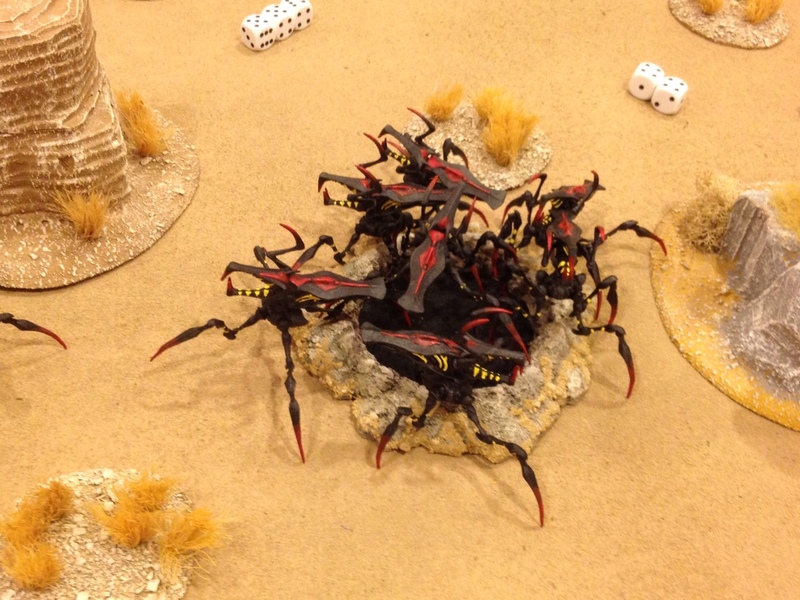 More Bugs pour out of a hole..."this place is crawlin', sir!" 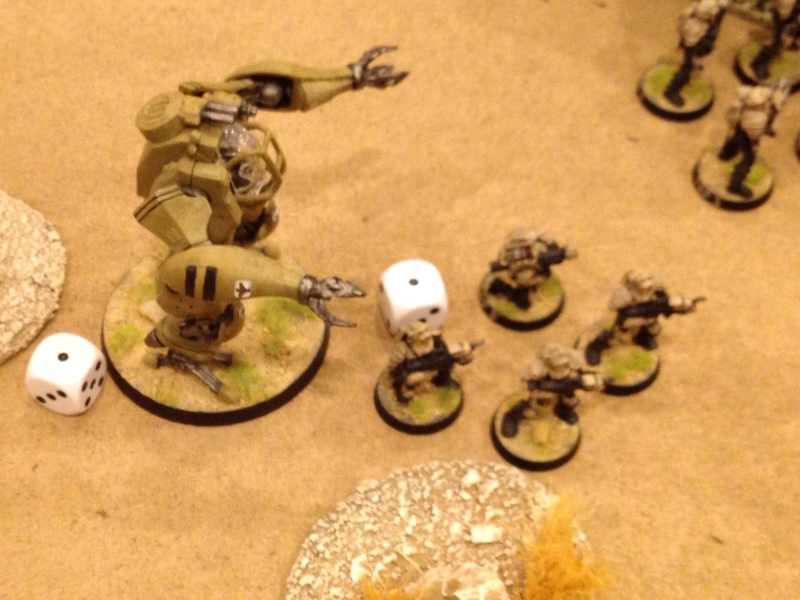 The game was the usual mix of highs and lows as the intrepid Mobile Infantry reacted to Bug parries and thrusts. This game has now been run at every Legends convention since 2005. 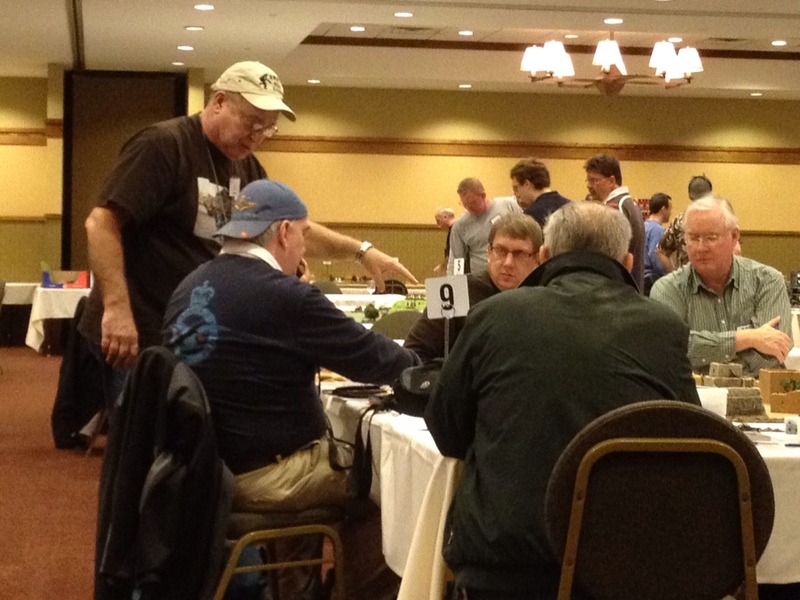 Tom had a full table of players and lots of dice being thrown. My understanding is that heavy fighting started early, kept going and didn’t let up until the last turn of the game. 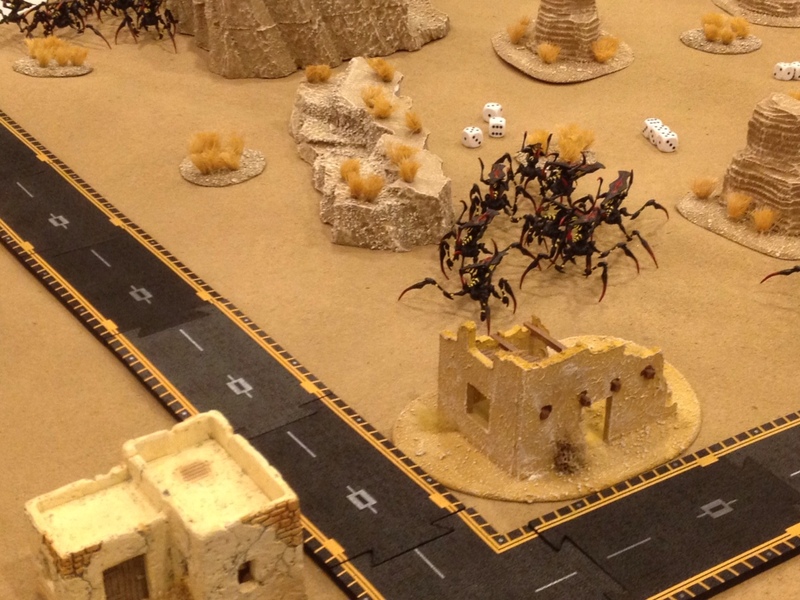 In both games that I ran, I had a USMC Recon element trying to go from one end of the board to the other against Tier One Taliban. 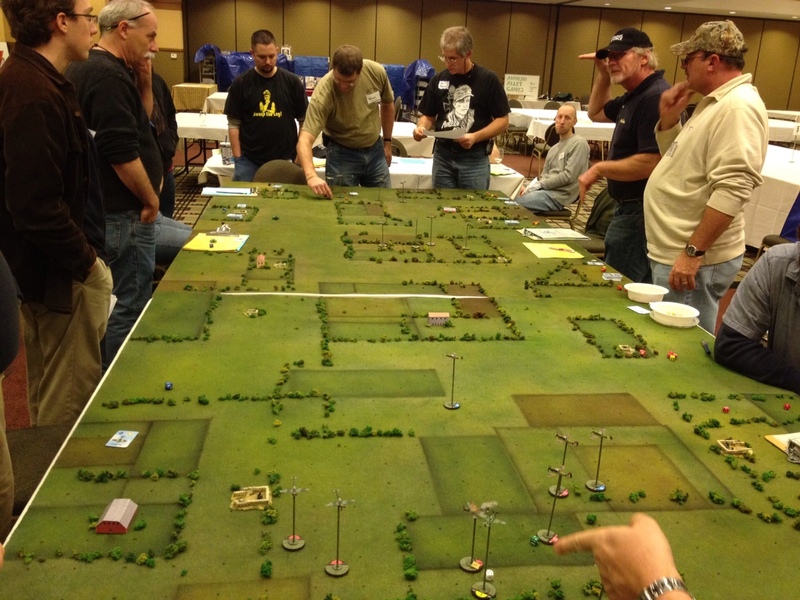 Both games saw the USMC have difficulties initially, but eventually prevail. The German and British flyers face over Britain. While this year’s Legends attendance was down from last year’s, the one thing is continues is the quality of the games being run. Thanks to Skip Peterson and everyone who helped to make not only this year’s convention, but all the Legends events, a success. We’ll be back in town for tomorrow’s Ambush Sunday game. This time, Will will feature his adaptation of Tomorrow’s War to a certain Gothic-themed far future which he has entitled “Gothic Special K.” We’ve been working diligently on the scenery and our figures, and I know a few others have been doing the same. Game time is 1 PM, although we’ll be there at 12:00 PM to set up and grab lunch next door. Location as always is Unique Gifts and Games in Grayslake, IL. For a break we pulled out an old set of rules from my collection; Pig Wars, mostly because I had a desire to bash some shields and get up close and personal. I had a number of Dark Ages figures (the old Revenge line from Old Glory and some Gripping Beast). Jon and Denny Walters had some Gripping Beast metals and some of the new plastic Vikings. Thus a Sunday afternoon slugfest was born! 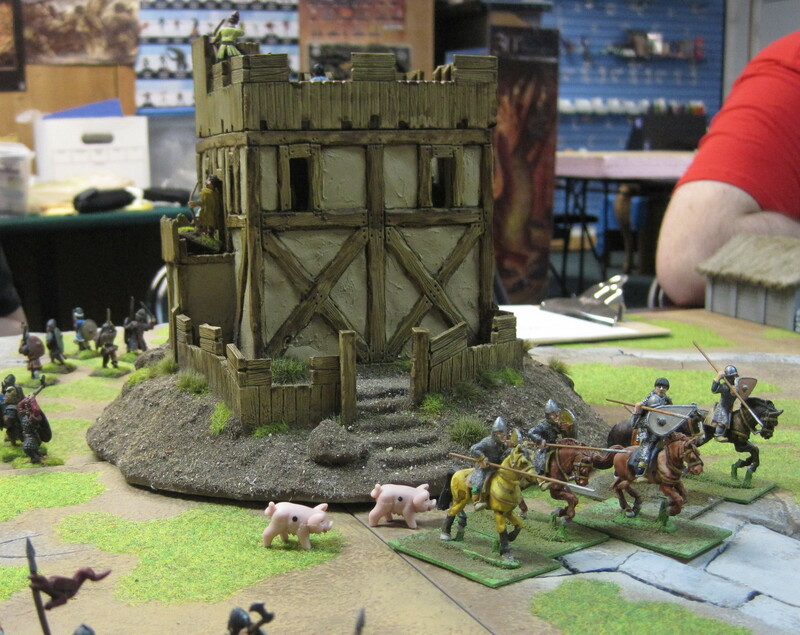 I spent a good part of Saturday night painting my Village Green Norman Keep. We used this as the central objective. Norman cavalry line up in front of the keep. A few things to mention about the photo. Yes, those are my Citadel Realm of Battle boards and yes, those are rubber pigs from the “Pass the Pigs” game. If you’re going to play Pig Wars you better have pigs, and I left my livestock at home, so Kathleen at UGG was kind enough to loan us her pigs. The scenario was as follows. A Norman tribute wagon has to get to the keep without being destroyed. To keep this from happening, the Norman side had a unit of 20 foot soldiers, 5 mounted knights and two units of 20 Saxons (in the employ of the Normans for now). 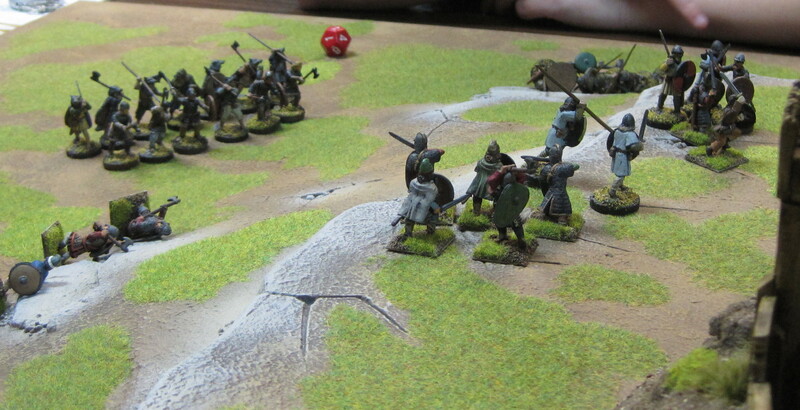 Attacking the tribute wagon were three units of 20 Vikings. The tribute wagon winds its way from the Saxon village toward the keep. Things did not go well for the Vikings from the very beginning. One war band made it to the top of the hill with the keep, only to be cut down by two different groups of Saxons, although the Vikings kept it interesting for a number of turns. Archery from the keep was relatively ineffective against the Viking shieldwall, but once they went up the hill the shieldwall disorganized and it was every man for himself. A few stragglers are left atop the hill, but the remainder of the Vikings regroup, defeated. My Vikings scratch and claw their way to the top of the hill. We reached the top and took a few casualties to archery fire from the keep while we formed shieldwall again. We were ready to face the approaching N0rman tribute cart! But wait…my fellow Viking Jon was not on my flank. He was busy being chewed to pieces by the Norman cavalry. A first charge left five Vikings dead and the remainder in retreat. A few turns later the Normans (who had headed back toward me) about faced and charged Jon again. That was all he could take. Another five dead and he was retreating once more. The Norman cavalry does a tap dance on Jon's Vikings. A predictable result, really, when I stop to think about it. No matter what game it is, Jon and his father Denny are always locked in a death grip with each other. It’s some sort of family thing with the Walters’. “There can be only one!” I imagine. At this point we decided to call the game. The end result was two pretty chewed up Saxon units, two chewed up Viking units and me standing on top of the hill taking archery fire with no friends around and some angry Normans heading my way. The rules are really very easy to play, although we dispatched with using playing cards for combat resolution and used 12-sided dice instead. We played the game in about two hours. Things bogged down a bit when we got into melee, but that’s par for the course with Dark Ages shieldwall combat. 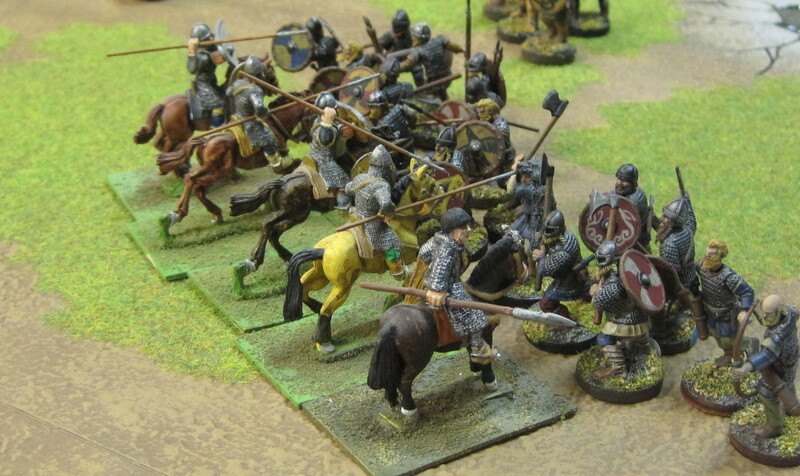 Our only complaint about the game (in fairness to Jon) is that cavalry seems very over-rated, especially against shieldwall formations. Still, with a few tweaks here and there, this is an enjoyable set of rules. As some of you may remember, I got a fancy new Canon Powershot with digital macro zoom for Christmas. It immediately improved the quality of my game photos. I also got the Cowboy Studios portable lightbox set up, which until today sat in the original packaging. After fumbling through some very poorly translated Chinese instructions, I got the light tent and lights positioned and started shooting. I am pleased by these early results, but know that I will improve even more with practice. 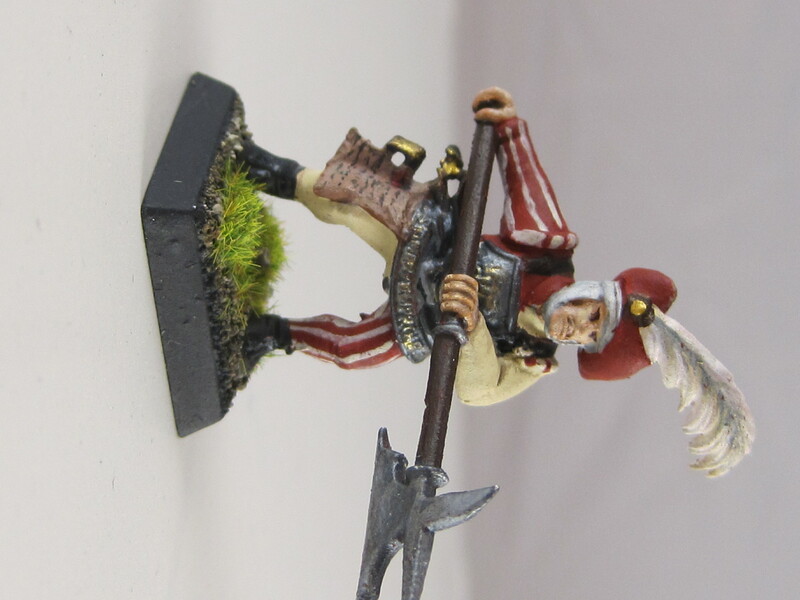 Here is a photo of a GW Empire Halberdier that I painted this week. All in all, I think I am on the right track and will continue to experiment this weekend. If any of you have any suggestions or quick tips, post them here so we can all benefit!